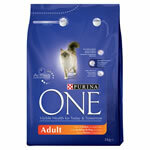 Get a free sample of Purina One Wet or Dry cat food. Simply register to be able to request your free 85g sample of Purina ONE Wet for Adult, Senior and Indoor or a 50g sample of Purina ONE Dry Adult. Depending on if you cat prefers wet or dry cat food you can choose the free cat food sample that your cat will like best or you can go for something different to see if it prefers something different.